Extraordinary chain of granite mountain-islands off the coast of northern Norway, inside the Arctic Circle. Ice-hewn peaks and spires rising sheer from the sea with fishing villages clinging to any scrap of flat land, often on stilts above the rocky shoreline. A wide variety of outstanding walks, up among the crags and lakes of the mountains and the wild Atlantic coastline. This chain of granite mountain-islands was carved by the last ice age into fantastic spikes and smooth sheer cliffs, gashed by deep fjords. Lying well inside the Arctic Circle, this is harsh but extraordinarily beautiful scenery. You can enjoy the rugged coastline or gasp at some of the world's most thrilling views from the high ridges. From a distance, the Lofoten wall seems like an unbroken mass; close up, it reveals itself as a series of improbably carved peaks and ridges up to 1,150m (nearly 4,000ft) high, rising straight out of the sea, separated by deep sounds and sheltering inlets which cradle ridiculously atmospheric fishing villages with brightly painted houses - sometimes built on stilts out into the water. The whole area has been submitted for World Heritage Site status. The Lofotens are reminiscent of the beauties of Milford Sound in New Zealand's Fjordland and - wait for it - Hong Kong, with its vast slopes of ice-smoothed granite and its remote little stilted wooden fishing villages (even the stink of the fish processing is strongly reminiscent). Maybe the water here is a little cleaner. The islands are composed of ancient granite, sharing their origins with the Scottish Highlands and the Appalachians of the USA. 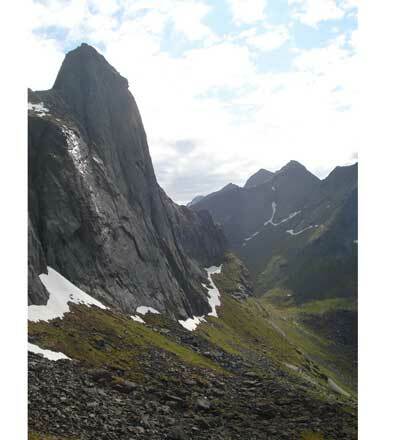 They were ground into their current shape relatively recently: this area was at the edge of an enormous ice sheet, up to 2km thick, that covered all of Scandinavia and which tore and polished the rock into the extraordinary peaks, crags, lakes and fjords that we now see. It was a tough life for the itinerant fisherman who rowed up in the dark of late winter for the cod fishing season. While fishing remains important, artists have moved up, attracted by the scenery and the long hours of cold summer light. 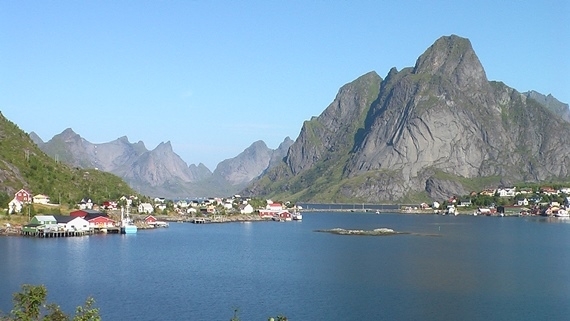 The Lofotens are a walker's paradise, every hill beckoning you and the coastline threaded with trails, the best along the wild, northern coast, where you can see dolphins and seals sporting in the surf. The whale watching can be superb here, and you can encounter elk on Austvgoy. Delicate arctic flowers bloom in early summer and rich colours and berries decorate the brief autumn. Try to walk on more than one island and vary the drama of the high viewpoints with at least one coastal path. There is no single outstanding walk, so you are free to choose. The walks described here are some of the best known, listed (approximately) from west to east. These walks take a day or less, but can be connected with other walks to form a longer expedition, involving stays in guesthouses, old Fishermens cabins (rorbuer) or camping. 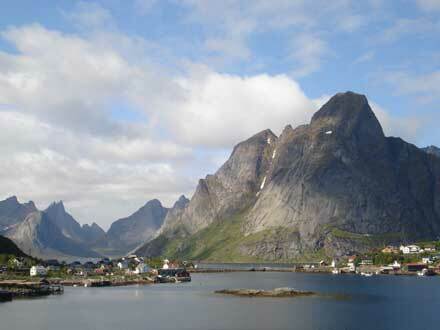 The following are some of the multitude of superb walks on the Lofoten. You will need to research which combinations of walks will suit you best. Try to walk on as many islands as you can and vary peak-bagging with at least one coastal walk. The many (and good) tourist offices have maps and information (of varying quality) on local walks. Hell and back: At the very tip of the southernmost island of Moskenesøy is the abandoned fishing hamlet of Hell. You can walk here, across a 600m high plateau with superb views, from the picturesque village of Å, the Lofotens’ westernmost settlement. You can get a boat to take you to Hell, and walk back. This would be a very long walk and there may not be a marked track to follow. 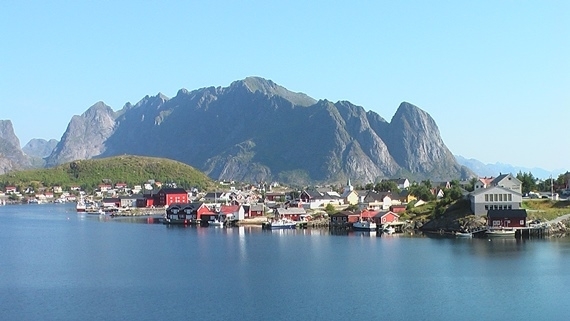 The island of Moskensøy has arguably the most spectacular, improbable scenery in the whole of the Lofoten. Much of it involves technical climbing skills. The island’s highest peak, Hermannsdalstinden (1,029m), a tough scramble with outstanding views, is one of the best hikes in the Lofoten. Can be combined with the Munkebu walk. Reinebringen: This 670m crag on Moskensøy is a difficult scramble up a very steep, rough path but has one of the best views of all, down over the Reine basin and along the Lofoten chain. Approximately 2 hours. 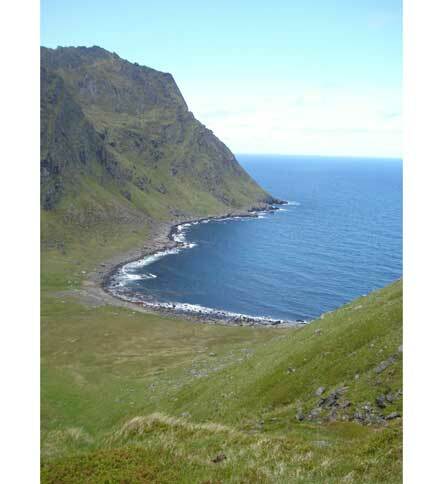 Mt Munkebu: This is a superb walk on the westerly island of Moskensøy. 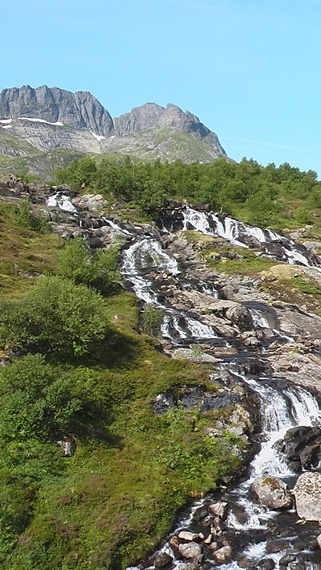 It starts along a gravelled track around a lake, just above the village of Sørvågen, then branches off up a steep granite slope, from the crest of which is a view of a beautiful cascade tumbling from the upper valley. A short clamber takes you to a stunning lake, surrounded on three sides by cliffs, steep 500m slopes of ice-polished granite and woods of diminutive birch and rowan. To the left, a valley retreats to distant peaks. It feels like the Alps, not a small island. The path meanders through the stunted forest above the lake. Near the far end, where the river drops from the higher valley in a lovely waterfall, the path cuts up a slope so steep that you need to pull yourself up on chains. 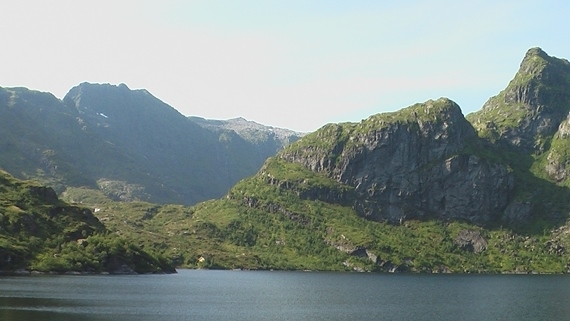 From the shoulder at the top, the view is even finer ahead: a narrow lake, embedded in sheer cliffs, with the valley receding behind it into high slopes of bare, grey granite. A beautiful stretch winds between tarns in an ice-scraped shelf. Slog up to the next ridge to reach one of the walk’s outstanding views over the adjoining fjord, which is narrow at its entrance, where the coastal road crosses it on a graceful bridge, and then recedes for a couple of kilometres into the bowl of tough crags where you will be standing. The sea sparkles beyond the bridge in the afternoon sun. 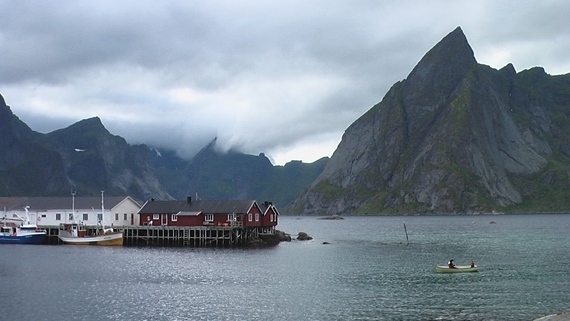 It was hot, sunburn weather when I was there – and well inside the Arctic Circle. Apart from the bridge, there is no trace of mankind here. 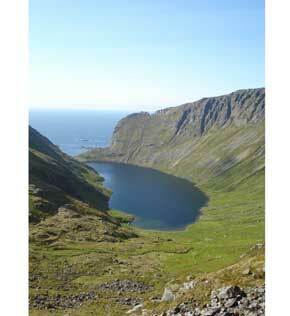 A further climb gets you onto the Djupfjordheia moor, surrounded by jagged ridges nursing patches of summer snow. At around the three hour mark, you reach the Munkebu hut. This is a magnificent spot, with views over Hermannsdalstinden, Ernthelltinden, three lakes on different levels and a tantalising peek over the lip of Ternnesvatnet into the slopes about Forsfjorden. You can spend the night here, provided that you have made the necessary arrangements with the Norwegian climbing club in advance, possibly alone in the long summer half-light, or you can get back to the trailhead for a round trip of around five hours. The scramble back down has its own beauties with the changing light; the northern slopes across the lakes may become an opaque mauve, their features shrouded. 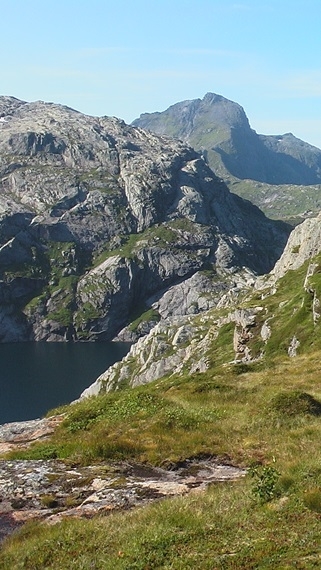 This walk can be extended with a climb of Hermannsdalstinden. Nusfjord to Nesland: A lovely coastal path on Flakstadøy from the superbly preserved fishing village of Nusfjord to the hamlet of Nesland. 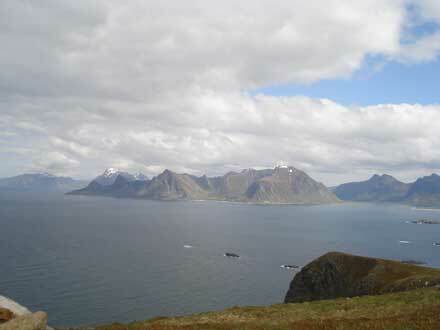 Nusfjord is a World Heritage Site, with hordes of visitors and diminished atmosphere. 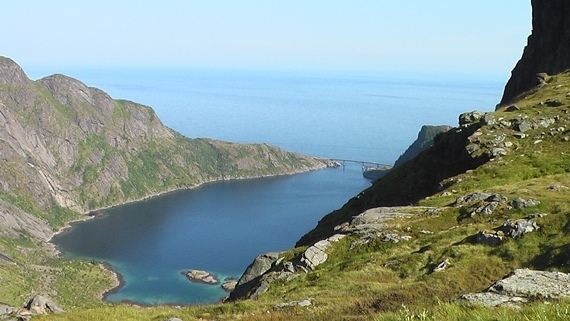 While this route is not as strenuous (or spectacular) as others in the area, it can still claim magnificent views out across the Vestfjorden to the mainland and down along the southern Lofoten coast, as it winds around vast boulders, through grass and stunted rowans and conifers. 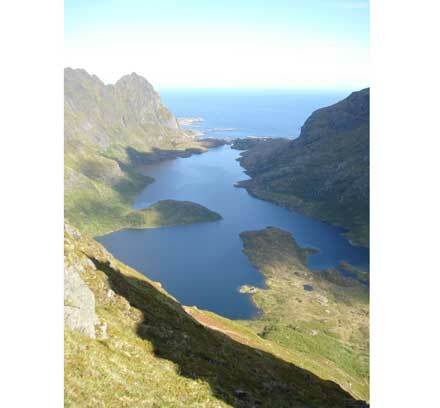 Eggum to Umstad: This is a wonderful 9km hike between two fishing villages, along the wild western, ocean-facing, coast of Vestvågøy. 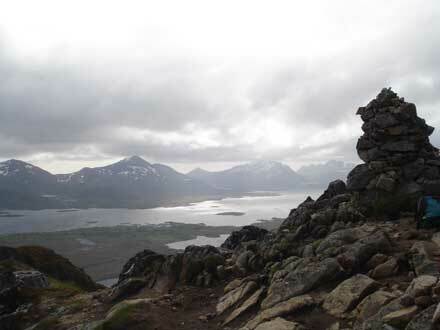 It is relatively straightforward, although there is some awkward bouldering following recent falls, and has excellent views of the Lofoten massif as well as out to sea. You will encounter a marvellous array of wildlife from seals to, with luck, sea eagles. Justadtinden: A longer walk up one of Vestvågøy’s highest peaks (at 738m), with exceptionally beautiful views – even by exacting local standards - of the Lofoten mountains and the sea. It is mostly a gradual ascent, although hard work towards the end. Coast to Coast*: From Å to Stokkvika and back: a path leads along the south shore of Lake Agvatnet. From the head of the lake, ascend through dwarf woodland and up a steep slope to the pass, where the views in both directions are outstanding. The last few hundred feet on both sides of the pass are tricky if wet. 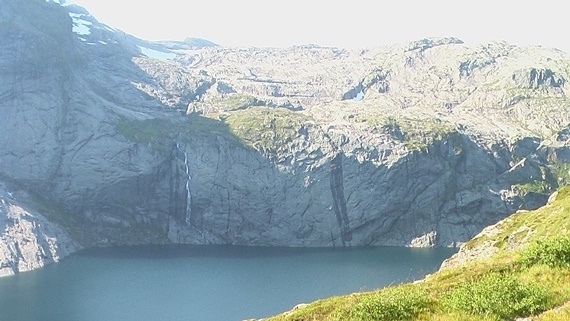 Descend to head of a second fjord and on to Stokkvika along south side. 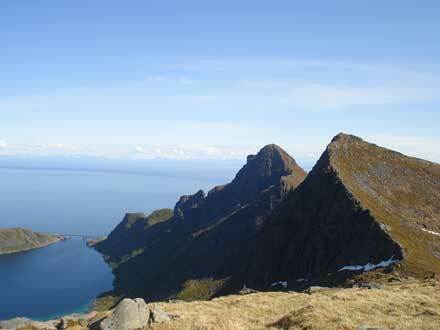 Extension of this walk along a ridge above mouth of the fjord on south side gives southward views down the west coast. There is no beach at Stokkvika, which is disappointing, but a delightful swim beckons in the shallows at the top end of Agvatnet if you can wait until after the precipitous return ascent/descent of the pass. 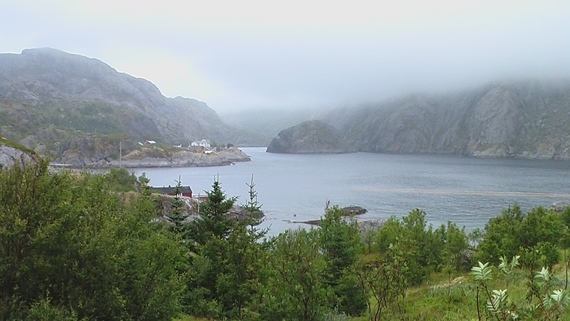 A short ridge excursion*: Ytresand to Stokvik: this charming jaunt at the north end of Moskensøy takes one to an area which one might otherwise neglect. The walk starts and finishes in a parking spot at the end of the road north of Ytresand. A path is marked up the hillside and on to the ridge which should be followed right round to the view up the Stokvikølva valley. Again, disappointingly for the arctic swimmer, there is no beach at Stokvik. Another short excursion for a magnificent panorama*: Offersøykammen (436m) is a short walk to a great view at the west end of Vestvogøy. From the car parking spot just before the Nappstraumen tunnel entrance, follow the path to the end of the island, then double back up the ridge and follow that to the tarn before ascending through dwarf woodland on a well marked path up the moderate slope to the summit. Steinstinden*: a circular walk above Stamsund: one can begin from the ski slope west of Stamsund and follow the lift to the ridge. Thereafter the route is much less straightforward and not for those who suffer from even minor vertigo. 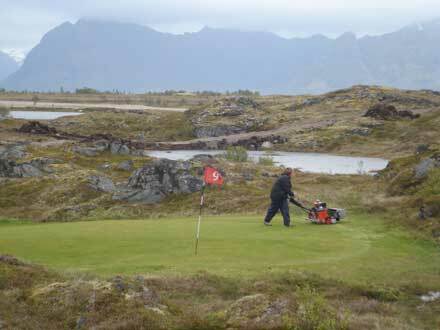 Golf with a view*: Hoven (368m): Gimsøy is not a large or a fashionable island, but from the ninth green of the Lofoten’s golf course a path leads to a pimple of a summit offering a charming panorama over the plain towards Vestvagøy and Austvågøy. Two passes for the price of one*: Selfjorden to Krokhammar: from the end of the road at Selfjorden find a dry path across the marshy ground around the head of Stormakpollen into the stunted woodland. Strike uphill on the well defined path between two streams and leave the large freestanding boulder on your left as you ascend to the lake. Keep the lake on your left as you wind along a boulder strewn path and up to the first pass. This is a time consuming business. 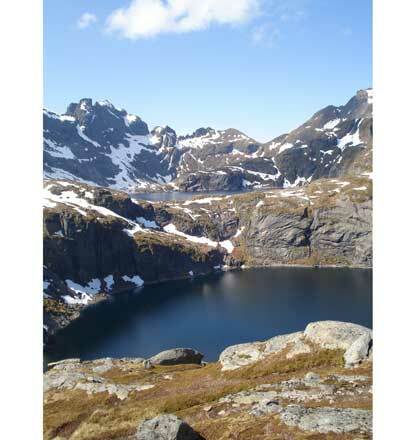 From this first col there are fantastic views back down the valley and ahead across Solbjørnvatnet. A welcome but thin track contours to the right and over a second col. From this second pass you are struck by sheer walls of rock opposite and on your left hand. The main peak of Krokhammartindan is so close as to appear to topple onto you as you eat your piece and contemplate the descent to the shore at Horseid. Here is a tricky choice: you can’t see Horseidvik from the col; you would like a bracing dip on the beach; but unless you can make it to Kjerkfjorden in time for the afternoon boat that swim will cost you the 400+ metre of ascent back up to this second pass. Perhaps retracing your steps is the more attractive option? 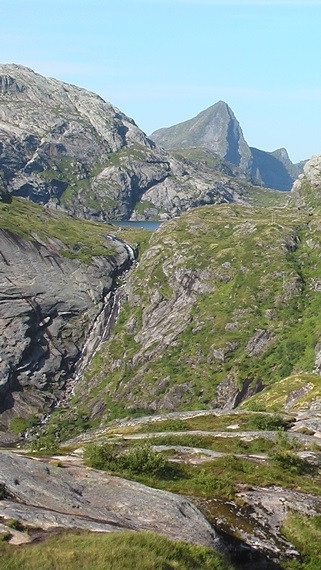 - Higuravrstinden (1,146m) on Austvågøy is Lofoten’s highest mountain. 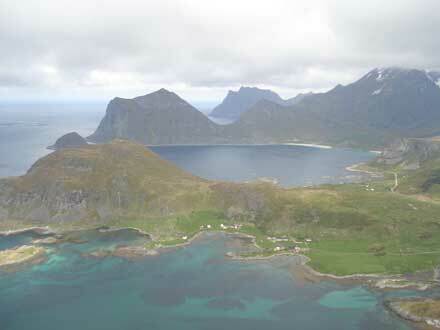 - Skrova island of Svolvaer has superb views back to the Lofoten “wall”. *These are all the recommendation of the estimable Patrick Gibbs (THANK YOU). He packed them all into a week. That’s probably why he remains thin. The jagged, sheer Lofoten Islands face the North Atlantic like a line of tough veteran legionaries awaiting some wild enemy. 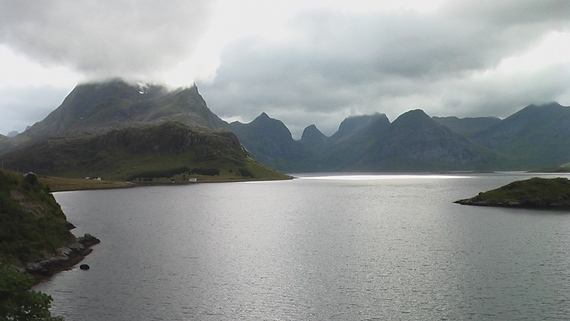 From a distance, the “Lofoten wall” seems like an unbroken mass; close up, it reveals itself as a series of improbably carved peaks and ridges up to 1,150m (nearly 4,000ft) high, rising straight out of the sea, separated by deep sounds and sheltering inlets which cradle ridiculously atmospheric fishing villages. The whole area has been submitted for World Heritage Site status.